Owner: LANTEK SHEET METAL SOLUTIONS, S.L. Notwithstanding the above and, as appropriate, both the company mentioned above and others of the Lantek Group (Lantek Business Solutions, S.L. and Lantek Investigación y Desarrollo, S.L. ), may also be data controllers of the data collected through this website and/or other domains, subdomains and landing pages, as may the following subsidiaries: Lantek Systèmes, SRL, Lantek Systemtechnik GmbH, Lantek Systems, Ltd, Lantek Systems, Inc, Lantek México, S.A de C.V., Lantek Polska S. Zoo., Lantek Yazilim Ticaret Ltd. Sti, Lantek Automation Pvt. Ltd, Lantek Netherlands B.V., Lantek System Korea Llc, and Lantek Middle East FZE. This legal notice will also apply to the websites, domains, subdomains and landing pages of the aforementioned companies. If the user does not agree, they must refrain from using the website www.lanteksms.com. LANTEK reserves the right to modify at any time the content, information, terms of this website, these conditions of use, privacy policies and other legal notices. If this occurs we will inform users through the website. The user acknowledges and accepts that all trademarks, trade names or distinctive symbols, content, all industrial and intellectual property rights, and/or any other elements included in this website, are the exclusive property of LANTEK and/or third parties, which have the exclusive right to use them for commercial purposes. In no case does access to the website imply any type of waiver, transmission, license or total or partial transfer of said rights, unless expressly stated otherwise. In accordance with the foregoing paragraph, users of this website are prohibited from reproducing, copying, transferring, distributing, modifying or using in any other way, in whole or in part, the information and content of this website without prior written authorization from LANTEK. The content of this website may not be reproduced in whole or in part, nor transmitted, nor recorded by any information retrieval system, in any form or in any medium, unless prior authorization is granted, in writing, by the aforementioned Entity. LANTEK owns the elements that make up the graphic design of its website, the menus, the HTML code, the texts, trademarks, logos, colour scheme, buttons, images, graphics and any other content of the website, as well as the structure, selection, arrangement and presentation of its content or, in any case, has the corresponding authorization for the use of said elements. The user is expressly forbidden from using the website for purposes which are illicit, prohibited or detrimental to third parties or that may, in any way, damage LANTEK’s brand, image or reputation. The user will be liable for damages of any kind that LANTEK may suffer as a result of the breach of any of the obligations deriving from any of these applicable conditions. LANTEK reserves the right to take legal action in defence of its rights. Personal data is collected on the website www.lanteksms.com through several channels, either via forms or through the e-mail address provided to establish contact with us. Users of the website www.lanteksms.com are informed that advertising or commercial communications will not be sent to them by e-mail or other equivalent means of electronic communication without their prior request or consent, which will be obtained through the corresponding forms provided for this purpose. In any case, users may object or express their refusal to receive commercial information by electronic means by sending an email to info@lantek.es. This option is available for every communication sent to them. LANTEK does not guarantee the absence of viruses or other elements in the content and therefore does not accept liability for damages that may be caused to user computers or systems due to possible computer viruses contracted during user browsing of the website. Similarly, the owner of the website www.lanteksms.com does not control or guarantee the continued access, nor the correct viewing, downloading or use of the elements and information contained in its website, which may be impeded, hindered or interrupted by factors or circumstances that are beyond its control and is not liable in the event of service interruptions, delays or malfunctions when they are due to causes beyond the control of LANTEK SHEET METAL SOLUTIONS, S.L., due to force majeure, or due to an intentional or culpable action on the part of the user. LANTEK SHEET METAL SOLUTIONS, S.L. does not accept any liability for the information that may exist about us on third-party websites or that can be accessed through search engines or from third-party links to our website www.lanteksms.com. Although the website www.lanteksms.com is not aimed at minors, they are permitted access. However, if a minor wishes to request information from us, they can only do so themselves if they over 14 years old. In the case of minors under 14, this request must be carried out by the custodian, guardian or legal representative, in which the latter, on behalf of the former, authorizes the company to process the personal data in such a way that said custodian, guardian or legal representative accepts the exclusive responsibility of deciding which services and content of this website that are appropriate for the age of the children under their care. LANTEK SHEET METAL SOLUTIONS, S.L. does not accept any liability in the event that the aforementioned minors provide us with their personal data in breach of these obligations. The total or partial of reproduction of any of the services or content of www.lanteksms.com is not permitted. No false, inaccurate or incorrect statement will be included regarding the website www.lanteksms.com nor about the services or content thereof. 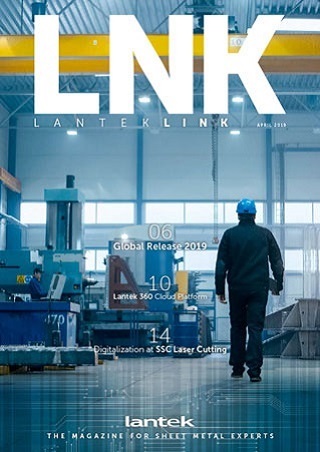 The creation of a "hyperlink" will not imply the existence of a relationship between LANTEK SHEET METAL SOLUTIONS, S.L. and the owner of the website or portal where it is added, nor imply knowledge and acceptance of LANTEK SHEET METAL SOLUTIONS, S.L. of the services and content offered in said portal. LANTEK SHEET METAL SOLUTIONS, S.L. will not be liable for the content or services made available to the public on the website or portal where the "hyperlink" is added nor for the information and statements included therein. Cookies are small text files that are stored on the hard drive or in the memory of the computer that accesses or visits the pages of certain websites, so that the user's preferences can be recovered when they reconnect. Cookies stored on the user's hard drive cannot read the data contained in it, access personal information or read cookies created by other providers. See information on the cookies used on this website in the “Cookies policy" section. The activity carried out through the website www.lanteksms.com is subject to current applicable Spanish legislation. For any dispute or conflict that may arise between LANTEK SHEET METAL SOLUTIONS, S.L. and the users of the website www.lanteksms.com, the parties expressly agree to submit themselves to the jurisdiction of the Courts of Spain, specifically those of the city of Vitoria (Álava), expressly waiving their own jurisdiction if one exists. At LANTEK we care about the personal data we process and about complying with current legislation on personal data protection, including Regulation (EU) 2016/679 of the European Parliament and of the Council of 27 April 2016 on the protection of natural persons with regard to the processing of personal data and on the free movement of such data, and repealing Directive 95/46/EC. Identity: LANTEK SHEET METAL SOLUTIONS, S.L. Notwithstanding the above and, as appropriate, both the company mentioned above and others of the Lantek Group (Lantek Business Solutions, S.L. and Lantek Investigación y Desarrollo, S.L. ), may also be data controllers of the data collected through this website and/or other domains, subdomains and landing pages, as may the following subsidiaries: Lantek Sistemes, SRL (Lantek France), Lante, Systemtechnik GmbH (Lantek Germany), Lantek Systems, Ltd (Lantek, UK), Lantek Systems, Inc (Lantek, USA), Lantek México, S.A de C.V., Lantek Pols,a S. Zoo., Lantek Yazilim Ticaret Ltd. Sti (Lantek Turkey), Lantek Automation Pvt. Ltd (Lantek India), Lantek Netherlands B.V., Lantek System Korea Llc, and Lantek Middle East FZE. For all matters relating to the processing of personal data, data subjects can contact our Data Protection Officer at the aforementioned postal address or by sending an e-mail to dpo@lantek.es. Principle of lawfulness, fairness and transparency the data we collect is processed lawfully, fairly and in a transparent manner with the prior consent of the data subject when necessary or, where appropriate, for the performance of a contract to which the data subject is party or in order to take steps at the request of the data subject prior to entering into a contract, or, if the processing is necessary for complying with an applicable legal obligation or for the purposes of legitimate interests pursued by the controller or by a third party. •	Principle of purpose limitation: the personal data we process is used for the purposes indicated in the section "For what purposes do we use your personal data?". Principle of data minimisation: according to this principle, the only personal data that we collect from users is that which is strictly necessary to manage the contractual relationship or to be able to respond to the inquiries, suggestions and/or requests for information that we receive. Principle of accuracy: the personal data we collect will be accurate and, if necessary, up to date. Therefore, if there are any changes to the personal data, the user must inform us so that we can update it accordingly. Principle of storage period limitation: the personal data that we process will be stored for the periods indicated in the section "How long will we keep your personal data?". Principle of integrity and confidentiality: to respect this principle, personal data will be processed in such a way as to ensure the appropriate security of the personal data, including protection against unauthorised or unlawful processing and against accidental loss, destruction or damage, using appropriate technical or organizational measures. For what purposes do we use your personal data (website users and others)? Customer data: to manage the appropriate maintenance, performance, fulfilment and monitoring of the contractual relationship with the customer and of the services provided. Furthermore, we will use identification and contact data to carry out satisfaction surveys and to send, by electronic means or otherwise, technical, operational and/or commercial information about news, our products and services and those of other companies of the Lantek Group. Potential customer data: to perform commercial prospecting, management of quotes and commercial offers, follow-up of these and to manage customer acquisition tasks. Supplier data: to manage the appropriate maintenance, development, fulfilment and monitoring of the contractual relationship with our suppliers and of the services they offer. Employee data: maintenance, performance, compliance and monitoring of the contractual relationship with our employees, as well as compliance with the Labour, Social Security and Occupational Risk Prevention regulations that may be applicable. Candidate data: to manage the participation of those interested in recruitment processes carried out by the company itself and other Group companies. This implies that when a candidate sends their CV to Lantek Sheet Metal Solutions, S.L. this will be used to manage their participation in both the recruitment processes carried out by this company and other companies of the Lantek Group. The corresponding Lantek Group company which starts a recruitment process. Visitor control data: to control the entry and exit of visitors from the company's premises for security reasons. Data collected through the newsletter form: to manage subscription and sending of newsletters or bulletins about the company, our products, services, news, articles, offers or promotions as well as other commercial content that may be of interest. Data collected through the contact form: to manage and respond to queries, suggestions and requests for information or services requested through this form. Recital 14 of the GDPR establishes that “The protection afforded by this Regulation should apply to natural persons, whatever their nationality or place of residence, in relation to the processing of their personal data. This Regulation does not cover the processing of personal data which concerns legal persons and in particular undertakings established as legal persons, including the name and the form of the legal person and the contact details of the legal person”. This implies that this regulation and the obligations and rights provided for will not be applicable to some of the data processing carried out by LANTEK, such as that relating to customers, potential customers, suppliers, visitor control and data collected through the contact form. What are the legal bases for the processing of your personal data? Customer data: the legal basis for the processing of personal data is the performance of this contract and the provision of the required services. In order to carry out satisfaction surveys and send commercial information of its own or of other companies of the Lantek Group, the legal basis will be the satisfaction of legitimate interests pursued by the data controller and/or third parties (other Lantek Group companies) as provided in article 6.1. (f) of the GDPR. This will be without prejudice to the possibility of the data subject objecting to the sending of said commercial information. Potential customer data: the legal basis for the processing of personal data is the performance of the pre-contractual and commercial relations maintained between both companies. Customer data: the legal basis for the processing of personal data is the performance of the contract established with the customer. Employee data: the legal basis for the processing of personal data is the performance of the contract established with the employee. Candidate data: the legal basis for the processing of personal data is the legitimate interest of the company in managing recruitment processes in order to cover job vacancies. Visitor control data: the legal basis for the processing of personal data provided by persons accessing our facilities is likewise the legitimate interest to control the entry and exit of visitors for security reasons. Data collected through the newsletter form: the legal basis for the processing of personal data provided when filling in this form is the consent given when subscribing to the newsletter and the consequent need for such processing in order to attend to the request and subscription. Data collected through the contact form:: the legal basis for the processing of personal data provided when filling in this form is the consent given when contacting us using this form and the consequent need for such processing in order to attend and respond to the query or contact received. All the personal data that we process at LANTEK is provided by the data subjects themselves or their legal representatives. The personal data that we collect through this website has been collected through the different available forms or through the e-mail address provided to establish contact with us. However, the personal data of commercial contacts or potential customers has been obtained directly from them at trade fairs and through commercial visits made by companies of the Lantek Group or by authorized distributors. The personal data of customers and suppliers will be communicated, where appropriate, to the tax authorities for compliance with legal and tax obligations, as well as to the financial entity/entities through which the Lantek Group company manages its incoming payments (in the case of customers) and outgoing payments (in the case of suppliers). Likewise, as part of the legitimate interests pursued by the data controller and/or companies of the Lantek Group, customer data may be communicated to any of these in order to send commercial information similar to the products or services that the customer has contracted. Similarly, other services are used (for example, to conduct satisfaction surveys or to send technical or commercial information, among other things) which are provided by companies that act as data processors and are located outside the European Economic Area, specifically in United States. However, in these cases we only hire companies that are covered by the EU-US Privacy Shield, therefore providing the same guarantees offered by this framework. 5 years: period corresponding to the statute of limitations on tax obligations. The same period for taking personal legal action that does not have a specific statute of limitations. 6 years: for books, correspondence, documentation and supporting documents concerning the business. With regards to the sending of commercial information, customer personal identification and contact data will be kept until the customer revokes its consent for said purpose. Potential customer data: in this case and to the extent that periodic contacts are made with potential customers to carry out the appropriate commercial follow-up, their personal data will be kept until the moment they sign a service provision contract or, as the case may be, until consent is withdrawn. Employee data: employee personal data will be kept during the validity period of the employment contract and, once it is finalized, for the limitation periods established by the applicable legal provisions. Candidate data: the personal data of candidates will be kept for a maximum period of two years. Visitor control data: the personal data of visitors will be kept for a maximum period of two months. Subscriber data: personal data will be kept until the subscriber requests to unsubscribe or withdraws consent to the sending of information and, therefore, to the processing of their personal data. Data collected through the contact form: the personal data provided by the user when filling in this form will be kept only while handling the request made to us in such a way that, once the request has been fulfilled, this data will be deleted. Data of our social media profile users: the storage period for personal data belonging to our followers on social media depends on the policies of each social media site, though we will only process this data until these users stop following us. Right of access to your personal data: for the purposes of knowing and checking the lawfulness of the processing, you can ask us at any time for confirmation of whether LANTEK is processing your personal data and, in if this is the case, we will inform you, among other things, about what data we are processing, its purpose, the source of the data, the envisaged period for which the personal data will be stored and, where appropriate, the recipients or categories of recipient. Right to rectification: you can request the rectification of any personal data that is inaccurate or to have incomplete personal data completed, including by means of providing a supplementary statement. In this case, you must indicate in your request what data you are referring to and the rectification that must be made, accompanied, where appropriate, by the documentation justifying the inaccuracy or incompleteness of the data subject to processing. Right to erasure ("right to be forgotten"): you may request that your personal data be erased and no longer be processed if it is no longer necessary for the purposes for which it was collected or otherwise processed, if you withdraw your consent, if it has been processed unlawfully or must be erased for the fulfilment of a legal obligation. Right to restriction of the processing of your personal data: in this case LANTEK will only keep your personal data for the establishment, exercise or defence of legal claims or for the protection of the rights of another natural or legal person or for reasons of important public interest. Right to data portability: you can ask to receive your personal data or ask us to transmit it to another data controller that you specify, in a structured, commonly used and machine-readable format. Right to object to processing: LANTEK will stop processing your personal data in the way you specify, unless we have to continue processing it for compelling legitimate grounds or for the establishment, exercise or defence of legal claims. How to exercise your data protection rights: you can exercise your rights by sending us a written request addressed to LANTEK SHEET METAL SOLUTIONS, S.L., Calle Ferdinand Zeppelin, nº 2 - C.P. 01510 de Miñano (Álava), or by sending an e-mail to dpo@lantek.es, accompanying in all cases a photocopy of your ID. LANTEK SHEET METAL SOLUTIONS, S.L. will respond to all requests within the deadlines and terms required by current legislation on personal data protection. How to file a claim with the Spanish Data Protection Agency: if you consider that we have not adequately processed your personal data or that we have not duly attended to the exercising of your data protection rights, you may submit a claim to the Spanish Data Protection Agency. More information about data protection rights and claims to the Supervisory Authority at www.agpd.es. In accordance with the provisions of article 32 of the GDPR, LANTEK SHEET METAL SOLUTIONS, S.L. has adopted the appropriate technical and organizational measures to ensure a level of security appropriate to the risk. In order to assess the appropriate level of risk, particular attention has been given to the risks presented by data processing, in particular from accidental or unlawful destruction, loss, alteration, unauthorised disclosure of, or access to personal data transmitted, stored or otherwise processed. LANTEK SHEET METAL SOLUTIONS, S.L. has taken measures to ensure that any person acting under its respective authority who has access to personal data provided by users, may only process the data following the company’s instructions, and must also maintain the corresponding professional secrecy of the data for an indefinite period of time. To this end, our employees have signed a document of confidentiality and duty of secrecy with respect to the information and personal data they process as part of their employment relationship with the company. We ask users to read the policies on the use of the website by minors we is published in the "Legal Notice" of our website. Social media profiles: LANTEK has profiles on the most important social media sites, which may result in the processing of the personal data of our followers, of people that appear in what we post (for example, photographs) and of people who send us private messages. Data processing and purpose: the data processing that LANTEK will carry out is limited and conditioned by the policies and functionalities of the social media site in question. When a user follows us on social media, they consent to their personal data being used only within the scope of the corresponding social media site for the management of our page or profile and for the communications that we maintain in a bidirectional way with our followers through the chat, messages or other means of communication that the Social Media site allows now and in the future. This implies that we will have access to the information of their profile that appears in the comments such as, by way of example but not limited to, their username, image (if the user has uploaded a photograph on their profile), and their posted comments. We also want to inform the user that when they follow us, the news that we publish may also appear on their wall and that, if they make comments on ours, both their comment and profile name as well as their profile photograph, if they have one, will be accessible to other followers. In any case, the use of social media is the user’s responsibility. We will not use the personal data of users for purposes other than those indicated in previous paragraphs nor send them information through a platform other than social media site in question. Unless the data subject gives their consent or sends us a request of any kind, we will not extract their personal data from the social media site. Data protection rights: with respect to the right of access, to rectification or erasure, restriction of processing, to object and portability of personal data we can only act in accordance with the possibilities that each social media site allows for. LANTEK will provide any possible assistance to the data subject so that they can exercise the aforementioned rights. In any case, our followers can unsubscribe from our page or profile at any time so we would no longer have access to their personal data, although the social media site may keep the comments they have previously posted on our wall. In any case, the use of social media is the user’s responsibility so LANTEK SHEET METAL SOLUTIONS, S.L. does not accept any liability in this regard. For more information about the cookies used on this website, click here. These cookies allow the website to work correctly in such a way that without them, some of the website’s functionality would be seriously affected. These cookies do not require consent, but information must be provided on them, as can be found at the previous link. They can only be disabled through the browser settings. These are Google Analytics cookies that can analyse the traffic on the website, so that we can improve the content and its presentation according to the results they provide on the habits of users when browsing the site. These are cookies that allow the user to be shown personalized Lantek ads on other websites that they visit. Cookies are small text files that are stored on the hard drive or in the memory of the device (computer, tablet or phone) that accesses or visits the pages of certain websites, so that the user's preferences can be recovered when they reconnect. Cookies stored in the memory of the user’s device cannot read the data contained in it, access personal information or read cookies created by other providers. First-party cookies: those that are sent to the user's terminal from a computer managed by the publisher and from which the service requested by the user is provided. Third-party cookies: those that are sent to the user's terminal from a computer or domain that is not managed by the publisher, but by another entity that processes the data obtained from the cookies. Persistent cookies: a type of cookie where the data remains stored in the terminal and can be accessed and processed during a period of time determined by the party responsible for the cookie. Technical cookies: those that allow the user to browse the website, platform or application and to use the different options or services in it. For example, to control traffic and data communication, identify the session, access restricted areas, remember the items that make up an order, carry out the request for registration or participation in an event, use security elements during browsing, store content for the dissemination of videos or audio or share content through social media. Personalization cookies: those that allow the user to access the service using certain general characteristics predefined in their terminal or defined by the user themselves. For example, language, type of browser used to access the service, selected content design, geolocation of the terminal and the regional configuration from where the service is accessed, etc. Analytical cookies: those that allow tracking and analysis of user behaviour on websites. The information collected by this type of cookie is used to measure the activity of the website, application or platform and to create user browsing profiles for these sites in order to introduce improvements to the service based on the usage data of users. Advertising cookies: those that allow the effective management of advertising spaces included on the website or application from which the service is provided based on criteria such as the edited content or the frequency in which the ads are displayed. Behavioural advertising cookies: those that allow the effective management of advertising spaces included on the website or application from which the service is provided. These cookies store information on user behaviour through observation, allowing the subsequent creation of specific profiles to display targeted advertising. What type of cookies does www.lanteksms.com use? Performance Cookies: this type of cookie saves information anonymously and allows us to: know your preferences and improve our designs or your browsing of the Lantek site, avoid errors, obtain statistics, adjust the speed of video transmission based on the compatibility of your browser, etc. Always with you in mind and making sure that the time you spend visiting us is as pleasant as possible. Geolocation Cookies: this type of cookie is used to find out the country from which you are accessing the website to therefore be able to display the content according to your location and in your language. Login Cookies: this type of cookie is created at the time you register on the website or sign in afterwards. These cookies are used so that when you sign out, log off the computer or turn it off, you continue to be identified as a user and the content stays adapted to your profile. Analytical Cookies: this type of cookie collects information about your browsing experience on the Lantek website completely anonymously. This means we access numeric data about user browsing on our website and improve functions as required. Therefore, these cookies help us directly in the improvements we add to the website, always looking to provide the best browsing experience and to offer a better service. Advertising Cookies: this type of cookie allows us to expand and personalize the information of the ads shown to each user. Among other things, data is stored based on the browsing patterns of each user anonymously so that we can subsequently offer you ads related to your interests. How can cookies and web bugs de disabled? The user is usually able to stop accepting browser cookies or cookies for a specific service. The way in which the user can disable cookies will depend on the browser or browsers used. All browsers allow you to change cookie-related settings. These settings are usually found in the “options" or "preferences" menu of the browser. Also, you can configure your browser or your e-mail manager, as well as install free add-ons, to avoid downloading web bugs when opening an e-mail. Go to Options or Preferences depending to your operating system. You will then see the Accept cookies option which you can enable or disable according to your preferences. After applying this filter, the cookies of the requested website will appear on the screen. Now you just have to select and press the X to proceed with deletion. Here will see the Block cookies option so that you can adjust the type of blocking you wish to perform. Go to Privacy and Security and you will see the Block cookies option so that you can adjust the type of blocking you wish to perform. Go to Security and Privacy and you will see the option Accept cookies where you can check or uncheck the box. What are the consequences of disabling cookies? If the user prevents the enabling of cookies or disables previously authorized ones, this may affect the performance of certain features of the website. For example, each time you access our website you will be shown the information notice about cookies that you must accept. This is the case of the cookie mentioned in the “performance" section. Similarly, we will not be able to obtain information on the user browsing of our website, which will prevent or hinder the improvement of the information and content we publish, as well as its presentation. This is the case of the cookies mentioned in the "Google Analytics" section. The structure and functionality of this website may be modified to add new sections, services or content, which modify its use and, by extension, our cookies policy. That is why we recommend that users review the published cookies policy every time they access our website in case there has been a change since their last visit. Data controller: LANTEK SHEET METAL SOLUTIONS, S.L. Purpose: Manage and respond to the queries, suggestions and requests for information or services requested through it. Lawfulness: Consent provided when contacting us using the form and the consequent need for such processing in order to attend and respond to the query or contact received. Recipients: The Lantek Group company which corresponds in each case to the request received. Data processors outside the EU, covered by the "Privacy Shield". Rights: Of access, to rectification and erasure of data, as well as other rights as detailed in the additional information. Purpose: Sending newsletters or bulletins with technical, operational and/or commercial information of interest. Lawfulness: Consent provided when subscribing to the newsletter and the consequent need for such processing in order to attend to the request and subscription. Recipients: Other Lantek Group companies to send their newsletter or commercial information. Data processors outside the EU, covered by the "Privacy Shield". Purpose: Manage your participation in the recruitment processes. Lawfulness: Consent given when completing the form and sending your CV. Recipients: The corresponding Lantek Group company which starts a recruitment process.